It is impossible to mention National Skydiving Champion Scott Borghese without first recognizing the person who influenced him most—his father Victor. Scott and Victor not only have been household names in the local skydiving community for decades, but have also made a major impact on the sport worldwide. It all began when Victor made an entrepreneurial gesture based on his passion and moved to Norfolk County to open the Simcoe Parachute Drop Zone in 1972. Victor grew the sport locally to include fifty full time members at the Drop Zone, encouraged over 400 skydiving enthusiasts to enjoy jumping in the area yearly, and trained the top Canadian skydiver twenty-two of the thirty years the Drop Zone was open. But it wasn’t just the coaching and promotion of the sport that Victor should be acknowledged for. Victor was a world-class skydiver himself, qualifying three times for the World Parachuting Championships. He also competed nationally at the age of 62. Though the Drop Zone closed in 2002, it is safe to say that Victor Borghese has left an indelible mark on Norfolk County in the sport of parachuting. You need not go any further than Victor’s son, Scott Borghese, when looking for evidence of this mark. Coming to Norfolk in 1972, Scott studied under the watchful eye of his father, laying the groundwork that would lead him to becoming the number one skydiver in Canada nine times. Competing internationally for some 22 years as of the time of his induction, Scott Borghese had seemingly done it all. 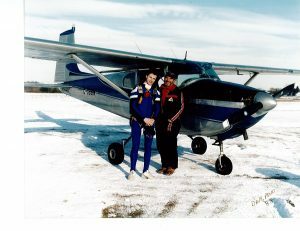 A 13-time qualifier for the World Skydiving Championships, Scott held four Canadian Skydiving records, had accumulated 49 National Skydiving medals, and had made four appearances dropping into Canadian Football League games by the time he was named to the Norfolk County Sports Hall of Recognition. In addition, Scott finished fifth overall at the 1997 World Air Games. However, it is not his status as an elite athlete which most people identify with. Following in his father’s footsteps, Scott also instructed young skydivers, instilling in them the same passion for the sport his father passed along to him as a child. Victor and Scott Borghese were the first father-son team to be inducted into the Norfolk County Sports Hall of Recognition.